SEYI America, Inc., Tullahoma, TN, has launched a line of single- and double-point servo presses (right) equipped with direct-drive servomotor and control technology that reportedly offer 30 percent higher torque than other direct-drive servo presses. The state-of-the-art servo direct-drive technology, connected directly to the crank, can maintain the same torque and energy as a mechanical press when the slide position is a from the tonnage rating point. It also optimizes stroke-motion programming flexibility, allowing pendulum strokes, multiple hits in one stroke and longer dwell time. Seyi’s unique energy-storage system, say company representatives, eliminates the issue of higher power requirements and minimizes energy consumption. A honeycomb frame construction maximizes rigidity, particularly at longer dwells. The hydraulic overload has been removed and replaced with an electronic overload to optimize resistance to deflection, and ensure repeatability at bottom-dead center. By Q3 2011, the firm will have ready for the market servo presses from 110 to 400 tons. 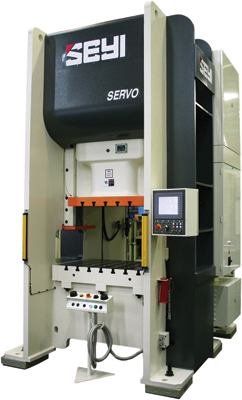 Learn more by accessing the firm’s servo-technology blog: servostampingpresses.blogspot.com. 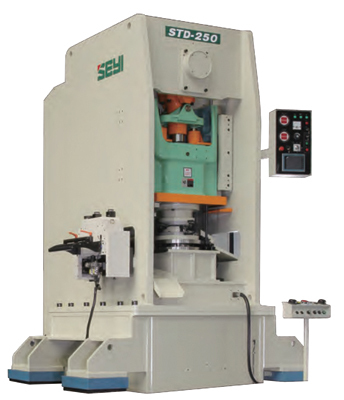 Seyi also announced the release of its STD special deep-draw presses, for parts to 160 mm high and 100-mm dia. —oil-filter housings, internal housings of vacuum bottles and other similar round or rectangular shapes. This unique press (above) is mechanically configured to run a three-stage drawing process in one stroke using one die, eliminating the need for large-footprint mechanical-transfer and hydraulic systems. The die module is comprised of one combination die with three-stage drawing capacity. The modules can be exchanged for varying part heights and diameters, minimizing die-design time and reducing tool changeover by as much as 60 percent. A fully automated high-speed production mode reportedly performs better than hydraulic operations within precise, stable BDC positioning. Maximum blank size: 340-mm dia. View a 2-min. video of the STD in action, producing oil-filter housings, at youtube.com/seyiamerica.